Designed by architects Holabird & Root. 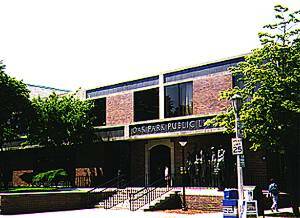 Emerging from Scoville Park on the southwest corner we are confronted with the modernistic Oak Park Public Library building. which employs the Prairie idiom in its interior spaces. This building replaced one of Oak Park's original buldings, the Scoville Institute. Read about the history of the OP Library. Before continuing on to Unity Temple, which beckons just ahead, the Blader has a more immediate question - who's standing by the door?